Submitted by Alexander Briones on Jan. 31, 2019..
93 out of 100. Incorporating 325+ ratings and reviews. The SansAmp Programmable Bass Driver DI (PBDI) is meant for players who need to change their sound between songs or even mid-song. It retains SansAmp's well received all-analog preamp circuitry, and adds a digital component to manage the controls, so you can conveniently store and recall settings in real time. This means that you get the best of both worlds, analog sound quality and digital preset switching, all in a single package. Be it for adding more oomph to certain parts of a song, or for switching to a more overdriven tone for your next song, the SansAmp PBDI lets you switch settings as you please. Other features include a dedicated XLR DI output, phantom power and ground switch, XLR out pad and a boost switch for the 1/4" output. While it is described as a 3-channel preamp, it is actually just a single channel preamp with the ability to switch between 3-presets via 3 dedicated footswitches. Dimensions: 7.25" x 5" x 2"
As its Gearank score suggests, a good number of bassists found the SansAmp Programmable Bass Driver DI to be more than satisfactory. Because of how it improves sound and adds to overall playing enjoyment, one user even quipped that it should be recommended by Doctors for depressed bassists! Experienced users found that this unit replaced the need for multiple amps and cabinets. Many also attested to how the SansAmp PBDI complements the sounds of different basses, from traditional Fender to modern Ibanez basses, along with many other brands. There were a few that wanted control over the mids, which this preamp does not provide. There were also some that had issues with amp head compatibility, but this is to be expected, because ideally, you only need one preamp to color your tone. 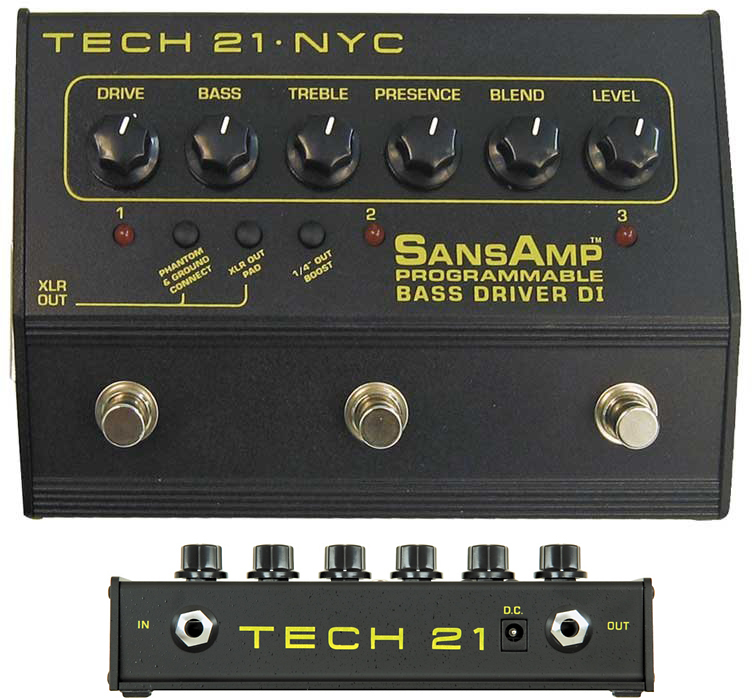 If you want analog tone and feel of SansAmp's preamp but want more flexibility via preset switching, then definitely get the Tech 21 SansAmp PBDI. If you're looking for a more traditional option then take a look at our guide to The Best Bass Preamps.